If you’re in Korea for an extended period of time, you will undoubtedly end up drinking some of these Korean alcohols. These Korean drinks can get you drunk pretty quickly, and if you wake up with a pounding headache, you’ll need something to get you back on your feet. Good thing you’re in Korea. Many Korean foods (mostly soups) are natural hangover cures. 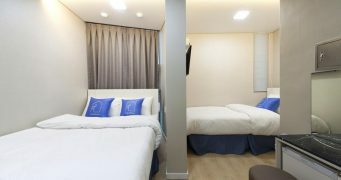 There’s a wide range of foods to eat after a night of drinking in Korea, and most of these can be found at your local neighborhood restaurant or even on your hotel room service menu. This pork-based Korean soup is literally named “hangover soup,” and accordingly, it’s one of the most popular things to eat after a night of drinking in Korea. Slurping up the rich and hearty soup warms up your stomach, and you can feel the nutrients seeping their way back into your alcohol-riddled system. Tip1: Potato Soup (gamjatang / 감자탕) is usually sold wherever hyejangguk is sold. The broth is essentially the same, and it’ll have the same effect. Tip2: As the word haejangguk (해장국) literally means “hangover soup,” there’s a plethora of Korean soups called haejangguk (해장국), all designed to cure your hangover. These two soups are popular Korean hangover cures because of their protein-rich broths. 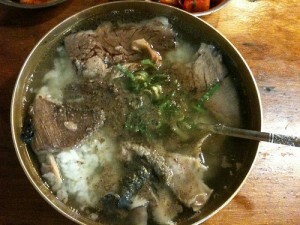 On top of that, there’s slices of beef (gomtang / 곰탕) or beef right off the bone (galbitang / 갈비탕) to help fill you up. It’s so good you’ll forget what you’re grandmother taught you about manners; if you’re hungover and hurting, you’ll find yourself slurping every last drop of soup. 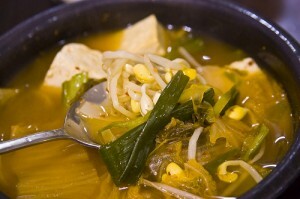 Tip1: Seolleongtang (설렁탕) must be noted for it’s hangover curing properties. The milky broth has a certain heartiness that can’t be compared. 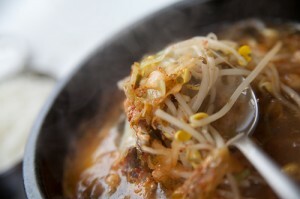 Tip2: Yukgaejang (육개장) is another beef-based Korean soup that’s great for curing hangovers. Spicy and meaty, a great combination! Kongnamulguk (콩나물국) – Vegetable-based Korean soup If you’re a vegetarian in Korea, bean sprout soup is a simple yet effective way to get rid of that nasty hangover. Filled to the brim with bean sprouts, this Korean soup contains asparagine, which apparently gets rid of the acetaldehyde that forms in your body when drinking. This is a common hangover cure among Korean people. 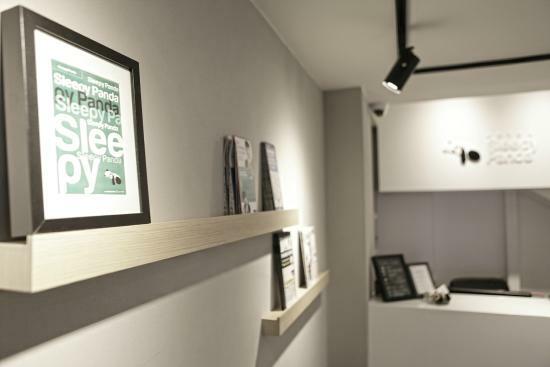 Even if you’re not hungover, Koreans claim it’s good for getting over colds as well. Comes in spicy and non-spicy varieties. Ever order some Chinese after a night of drinking in your home country? Korea is no different, except this is Korean-Chinese food. Do as the Koreans do and relieve your aching body with this spicy, seafood based noodle soup. The heat it brings to both your mouth and your stomach really helps offset the damage you did last night. It’s the order-in version of hangover cures. Yuksu (육수) – beef broth – often found at Naengmyun (냉명) restaurants. Odenggungmul (오뎅국물) – fish cake broth – street food vendors offer unlimited amounts of this (for free!) with any purchase. Ramyun (라면) – instant noodles – a simple, quick and easy food found in convenience stores all over Korea. 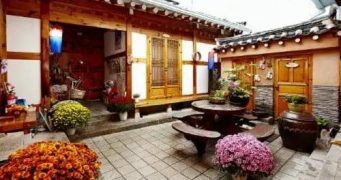 – Look for any Korean food that ends in -gook (국), -gookbap (국밥), -tang (탕). Most any of these will help. 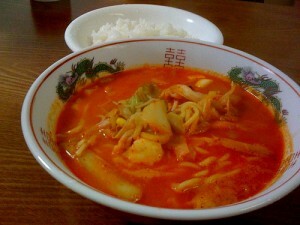 – Stews (jjigae / 찌개) are preferred by some, but not all, as popular hangover cures. – 해장하다 (haejanghada) means to eat or drink in order to get over a hangover. Got any Korean Hangover cures of your own? Share with us in the comments section. I like galbitang but spicy seafood stew is also good. Beyond these food, dried pollack soup(북어국) is also helpful for hangover cures ! Gatorade, pepcid ac or Nexium if you have a prescription for it, hot shower, advil, and sleep. And of course eat some gamja tang. seullungtang was my go-to hangover soup. It’s as bland as you want and with salt/pepper/kimchi, as spicy or flavorful as you can handle! Hi I’m Korean. sorry but “Gamja” is one of the name of pig bones (But it’s not). so it is not a potato. S Korea leads the world in alcoholism and suicides. They need more than solutions to hangovers.